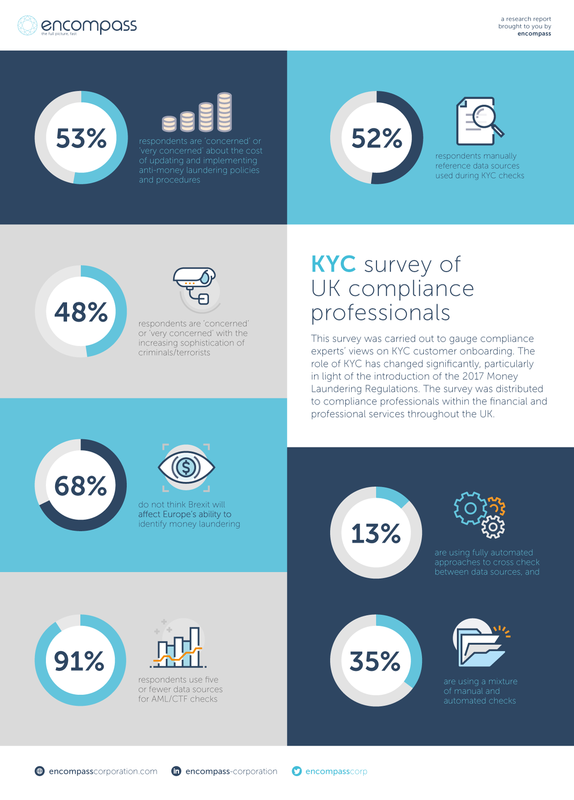 As a market leader in the RegTech space and leading supplier to financial and professional services firms in their technology for Know Your Customer (KYC) onboarding, encompass has conducted a poll of KYC professionals to gauge their approach and attitudes to compliance in light of new legislation. encompass polled KYC experts from both the professional and financial services sectors between July 1st and September 1st of this year. When surveyed, a majority of compliance professionals identified the increasing sophistication of criminals and terrorists as a primary challenge they face as they review KYC due diligence practices in light of MLR 2017. Certainly, money launderers can be sophisticated criminal operatives. They understand the imperative to build trust with financial services, legal and accounting firms before attempting to launder funds. Any firm with a current practice of assessing risk solely for a client, and not for each new case or new service opened for a client, and based on their first request for service, is open to risk of subsequently being used for criminal activity. Such practices must be discontinued and replaced with more penetrating due diligence.In the survey we found that over half of respondents said they cross reference Know Your Customer (KYC) data sources manually when carrying out checks. In addition, 90% of respondents said they use five or fewer third-party data sources when understanding beneficial ownership, or those with control of corporate clients. Manual checks are associated with a higher level of risk, and higher costs. Following the introduction of the 2017 Money Laundering Regulations, due diligence is a more complex task. The risk of reputational damage and fines means we expect to see a move away from manual in favour of much greater use of automation and robotic search for KYC and AML checks. The survey also highlighted some Brexit concerns, with a sizeable minority believing it could impact AML. My view is that as KYC is a global challenge, departure from the EU will not create a major divergence of legislative policies between the UK and the rest of Europe when it comes to AML. The Financial Action Task Force, the intergovernmental body overarching AML/CTF regulatory standards, has set an international benchmark which all organisations operating in a global business context should be aware of.